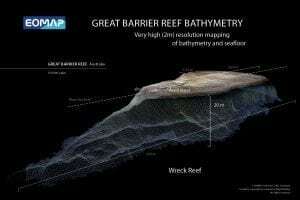 [Via Satellite 12-05-13] The recently released 3-D map of the Great Barrier Reef created by the German company EOMAP in conjunction with James Cook University in Australia is one of the more unique projects in the Earth Observation arena. The map covers approximately 350,000 square kilometers at 30-meter horizontal resolution. With this project, EOMAP hopes to send a signal to the market about its ambitions that is as clear as its imaging. EOMAP is a spinoff of the German Aerospace Center and was supported by the European Space Agency’s (ESA) Business Incubation Center in Bavaria. Mapping the Great Barrier Reef was a strategic demonstration project; it’s waters have been difficult to chart due to the size and complexity of the reef, making it a hazard to ships and difficult for conservation efforts. Using LandSat 7, EOMAP was able to map the surface underneath the water, a process known as bathymetry, at a previously unreached level of detail. “The process to derive bathymetry is called a physics-based process. That means we use satellite imagery not as imagery and then do some empirical relations to derive certain parameters, but we take up the calibrated satellite images,” explained Heege. EOMAP’s Modular Inversion and Processing System (MIP), used for satellite-based observations, includes corrections for sun glitter, water depth and albedo from the sea floor and nearby coastlines. The company has traditionally taken projects on an individual basis, but now it hopes to shift from working on a case-by-case schedule to an off-the-shelf method. Mapping the Great Barrier Reef marks a turning point from which EOMAP hopes to support future demands with an existing suite of products. “We will have many areas of the work in our off-the-shelf database so clients can directly go and get the bathymetry products they need,” said Heege. The company works with a variety of EO satellite operators including ESA, RapidEye and DigitalGlobe to collect bathymetric observations. EOMAP has used DigitalGlobe’s WorldView 2 satellite and NASA/USGS’s Landsat 7 and Landsat 8 satellites for high quality 2-meter resolution mapping in the past. Now the company is readying itself for the Sentinel 2 satellites, in development by ESA, to provide more complete coverage. EOMAP is working together with the German Aerospace Center and ESA to build the infrastructure necessary to use Sentinel 2. “Quickbird (a DigitalGlobe satellite) is getting a little older now and the calibration is not as stable. As we see more well calibrated satellites available we can implement them to make more area available,” said Heege. “[Today our] satellite coverage is not yet good enough so we simply don’t have worldwide coverage of the capable areas. This will significantly increase awareness, and we will have a much better worldwide coverage, which we cannot have yet.” From there the company will be able to create a large enough off-the-shelf index, and will use it as the primary method of selling EO data.